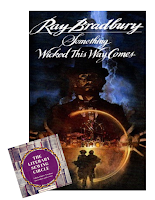 I have just barely made my own deadline for posting my Literary Sewing Circle project! I sewed all through this rainy weekend to finish off my design, which I'd laid out and cut last week. I have had a length of vintage rose print cotton in my stash for quite a while -- pink and red roses on a black background seemed to fit this book & this quote well. But I know it's vintage as it was only about 36" wide. Thankfully I had nearly 3 metres of it so after trialing a couple of designs I found one that would fit onto this narrow fabric -- nearly. I would have to make the neckband and linings out of a coordinating fabric. I chose Simplicity 2927, a 60s influenced style -- also suitable since Something Wicked This Way Comes was first published in 1962. I got this pattern in the pattern swap at PatternReview Weekend in Chicago so thank you to the anonymous sewist who donated it! Then I espied a 1/4 yard of black and white polka dot cotton in my stash & thought it would be perfect to use for the neckband. It adds a fun Carnival flair! I also used the polka dot cotton for the pocket and sleeve linings, but had to use a plain black cotton for the underside of the neckline, as I ran out of dots. I used up quite a lot of my stash making this dress! I'm pretty happy with it -- vintage roses and dots, on a black ground, with a 60's feel -- says Something Wicked to me! The only thing I'm not happy with is that somehow I missed the extra inch I needed to take out of the bodice length when measuring everything -- if it was one inch shorter above the waist, it would sit more comfortably and have less extra fabric pooling at the small of my back. Oh well, it's good enough to wear and I know to adjust the next time I make it. I think it's a fun and easily made pattern with some neat details, like the pockets and the two piece sleeves (love those). The pattern construction was easy and straightforward, though I had thought on first look that the pockets were inseam ones. They're actually topstitched patch pockets (though I think it would be pretty easy to make them inseam ones if you wanted to). The buttoned neckband is cute, and comfortable. This pattern is a winner for me. Really recommended -- I think it would make a fun winter tunic in a softer fabric as well. So adorable, and I love the contrast polka dots. I actually have this pattern and forgot about it. Sometimes necessity creates a wonderful surprise - I'm glad I chanced on the polka dots instead of going with a solid black or pink! It's a really straightforward pattern, I was pleased by how basic the sewing really was in the end. Beautiful rose fabric!! I'm glad the pattern worked out for you. It did! I am so happy that I finally got to use this fabric! Hi Melanie, Beautiful dress. Love all the extra detail you put in, having polka dots with roses, the linings etc. And the collor is amazing! So will you be wearing this to a fair? This dress is perfect. Love the polka dots too! I just found the podcast (Clothes Making Mavens) and heard about this sewalong. Sounds like something that would be perfect for me! Is there a new sewalong coming up? I too discovered your blog via the podcast Clothes Making Mavens - just last week. I was searching for an interesting podcast to listen to while doing catch-stitching work...and seeing the words "literary" and "sewing" together piqued my interest! Great interview too...and I was totally inspired!! I am currently working on my first couture style sheath dress in Black Watch tartan fabric, and once done with this work I hope to participate in your literary sew alongs in the near future! 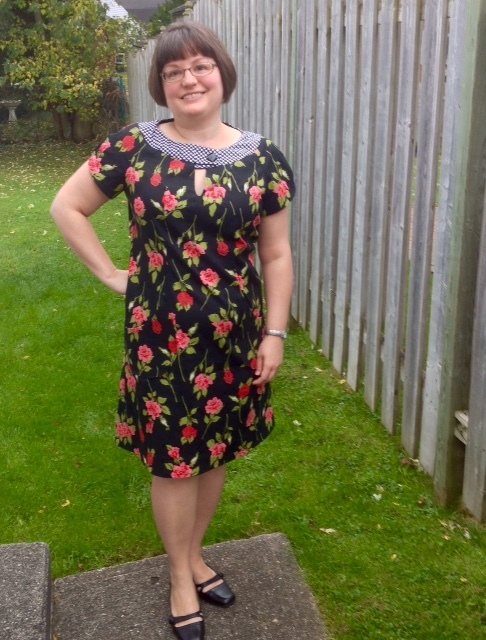 Also fabulous to find a fab sewing blog from a fellow Canadian! Couture Black Watch tartan sheath dress! Wow, I am impressed! So glad you discovered the podcast (so much fun talking to Lori & Helena!) and are interested in the Literary Sewing Circle -- yes, it's always nice to meet a fellow Canadian. A new sewalong will be started up in the new year, hope you'll join in.